In this second book of the Coraggio! 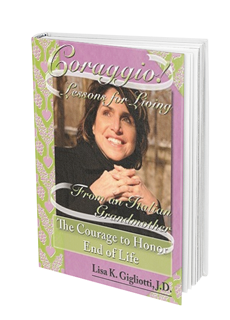 series, the author shares more of the Old World wisdom learned from her beloved Italian grandmother, adding a fourth, faith-based lesson to the three presented in Coraggio! Despite Illness, Pain, and Loss. 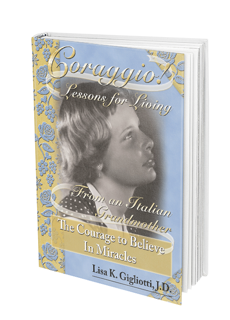 Her ongoing story of endurance in the face of dire obstacles turns to a miracle witnessed by her great-grandmother in a small Italian village in the 1800s and its deeply enriching effect on her grandmother’s faith. The author, diagnosed with rheumatoid arthritis and myasthenia gravis, had come to perceive God as a displeased avenger. Yet, in reflecting on her grandmother’s courage to trust in the miracle, she experiences a miracle of her own.